With the upcoming President’s Day weekend jam-packed of events in Miami, Brightline is the perfect means of transportation to get to any and everything. In just one weekend, Miami will host the International Boat Show, Miami Yacht Show, Coconut Grove Arts Festival and iii Points Music Festival. Visitors and locals of South Florida can avoid the area’s unpredictable traffic and jump on Brightline to arrive right on time. This weekend, Brightline is offering some promotions riders. The promo code GOSMART gives riders 25% off all Smart tickets. For those traveling with friends and family this month, get up to four on board for free. Riders who buy two SMART tickets, get up to two free, riders who buy three, can get up to three free and riders who buy four, can get up to four free, using the promo code BLFAMILY. And with the children out of school Monday, families can use Brightline and receive a 50% discount on SMART tickets for kids under 13. 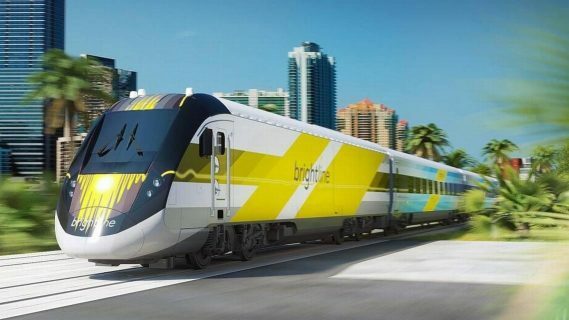 Those riders taking Brightline this weekend are also in for a special treat, as the train will be debuting a new cocktail this weekend. On The Rocks, a premium cocktail brand that provides complex flavors of crafted tailored cocktails in a single, ready to drink bottle will be offered on board and in the station. Cocktail offerings include Bourbon Old Fashioned’s, Jalapeño Pineapple Margarita, Classic Margaritas, Cosmopolitans, Mai Tai’s and Aviation’s (gin and vegetable juice) This weekend only they will be two for $12.